The iDevices bring the Bluetooth technology to your kitchen. With the Kitchen Thermometer you now have full control of your food while its cooking. 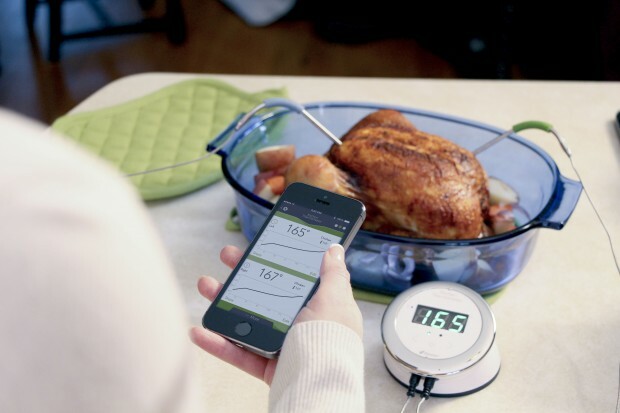 You insert the Bluetooth enabled Kitchen Thermometer probe into the food you wish to cook and you select the type of meat in the iDevices® Connected app. When the desired food temperature is reached, the app alerts you that your food is ready. Simple as that. With the iDevices Kitchen Temperature, you have the flexibility of cooking 2 different types or pieces of meat at the same time within the same oven by having two temperature probes, once in each piece of meat. You set different temperatures and you can monitor their cooking progress via the iDevices app. Are you feeling already like a chef? From now on, Thanksgiving is going to be a completely different celebration. Properly cooked turkey at the right temperature with no surprises. Time for your kids to make fun of you for a different reason. I’m pretty sure they can come up with something nastier than your cooking skills. What kind of meat are you cooking? No matter what you would like to cook, the app contains many different cooking presets. You can choose among, pork, beef, chicken and fish or you can just customise a preset for dishes you know already at which temperature they are ready. No restrictions, full flexibility.